And they aren't even a single bit granola looking. 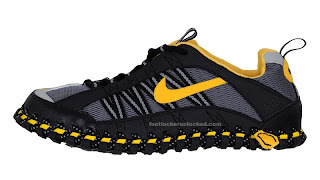 Introducing the Nike "Terra Humana Considered," a whole lotta name for that cute little shoe. Coming to Foot Locker on 34th Street in May, it's made with recycled materials and is stitched together, thus no toxic glues are used in production. Guilt, begone! And I really love the black and yellow. Also, for you sneakerheads, the shoe below (low top retro version of original Jordan) is part of a package available tomorrow at Foot Locker on 34th Street. Go to the Foot Locker blog Unlocked for more info on the other two shoes. 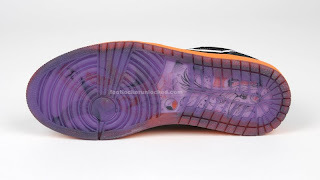 I'm personally too enamored by the purple sole and stitching to look at anything else. Sigh. Foot Locker, 120 W. 34th Street between Broadway & 7th Ave.
Nike has been having some great sneakers lately! yiqin - right?? i love the retro versions. seeker - I did, thanks! 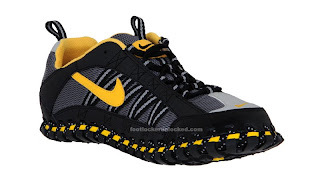 Today while I was surfing the Internet, I came across several articles talking about choosing the perfect sports shoes. I was particularly interested in basket ball shoes that offer optimal support and cushioning and are light weight and flexible. 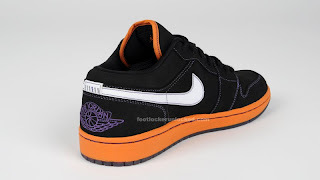 What I found is that Zoom Kobe IV is an ideal option as it offers all the above and is also one of the top rated in the Nike brand. So if you are on a serious look out for a professional basket ball sports wear, maybe you can try this brand as you would definitely want your shoes to last long. Also, the brand plays an important role when buying good shoes as it would not be good if your shoes fall apart while you are playing and you end up hurting yourself. So make sure you are get yourself the best brand and also that can offer you all that you need for playing comfortably. So if you have those old shoes, then its time you look out for a replacement and enjoy more comfort.